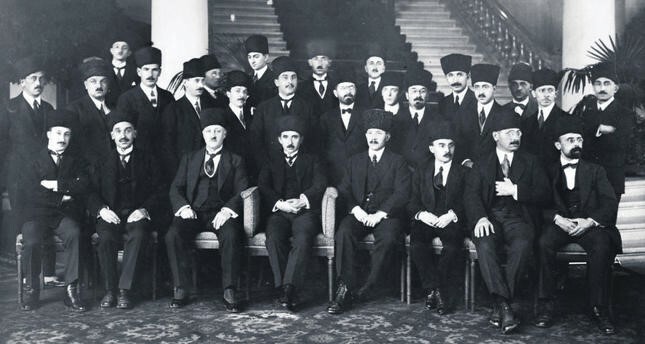 Turkish Delegation at Lausanne led by Ismet Inonu. TCA celebrates the 94th anniversary of the Treaty of Lausanne, which recognized the boundaries of the modern state of Turkey. This international treaty was signed on July 24, 1923 and shortly thereafter, the Republic of Turkey was proclaimed on October 29. The Treaty of Lausanne followed the signing of the Armistice at Mudanya on October 11, 1922, after decisive victories by Turkish national forces led by Mustafa Kemal Ataturk. Britain was forced to lift its occupation of Istanbul and the Turkish straits and call for a peace conference following the final defeat of Greek forces, which invaded Anatolia as Britain’s surrogates, and as occupying Italian and French forces decidedly moved toward non-confrontation with the Turkish national resistance movement. The Turkish delegation to Lausanne was led by Ismet Inonu, the victorious commander of the final battles that led to the peace negotiations. Countries represented at the peace talks were Britain, France, Italy, Japan, Greece, Romania and Serbo-Croatia. Russia, Belgium, and Portugal entered the treaty negotiations at later stages to discuss the status of the Turkish straits and financial matters concerning the defunct Ottoman Empire. The Unites States attended the treaty negotiations as an observer. The negotiations began on November 21, 1922 and lasted over eight months. Turkey’s main concern was to achieve recognition of its borders as defined in its National Pact of 1920, gain control over the Turkish straits, and end the economic concessions and privileges (capitulations) conferred to some European states. At the end of the conference, the Turkish borders gained international recognition with special provisions placed on Iskenderun and Mosul. The status of Iskenderun was later determined by a local referendum and the province legally joined Turkey’s borders on June 23, 1939. Mosul remained outside of Turkey’s borders and subsequently became part of Iraq. Turkey also gained control of the straits with special provisions to regulate international commercial traffic and rights by the Black Sea littoral countries, which were later codified by the Montreux Treaty on July 20, 1936. Finally, capitulations were abolished.